Breathe, Think, Do app (iPhone/iPad; Android; free) developed by Sesame Street, is geared to children ages 2-5 years using a Breathe, Think, Do strategy to promote problem solving and emotional coping skills. 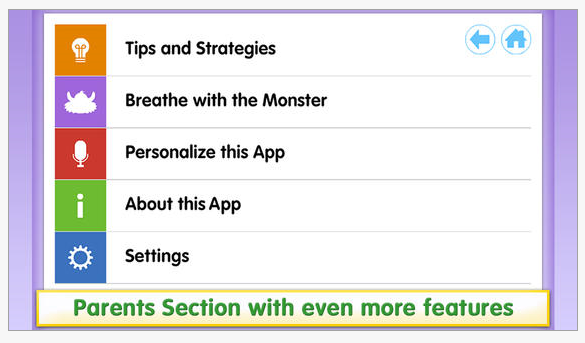 Just one of the tools of the Little Children, Big Challenges Sesame Street Initiative, this app provides tap and touch to help a monster friend take big breaths, think of a plan and try them out. Many other tips, guides and activities are available for printing from the Little Children, Big Challenges Sesame Street Initiative web-site. Thanks to Margaret Rice for her featured post, Free App to Help with Self-Regulation, Deep Breathing and Motor Planning found on Your Therapy Source Blog, on this app along with other resources available for calming . Have you tried this app with young children? Any other apps you use with young children for self-regulation? This entry was posted in Activities of Daily Living, Android, App Reviews, Apps for OT's, Apps for Special Needs, Early Childhood, Elementary School, iPad, iPhone, Self-regulation, Social Skills, Therapist/Teacher Tools. Bookmark the permalink. Oh! I can’t wait to hash are this one at home! Great strategy with a fun approach for Macy! Thanks for sharing. There are some apps for breathing, anxieties- I will review those. He is working on Zones of Regulation and he reported that the app was purchased by his parent. We’ll work on the strategy end of it! Thanks for your comment Gina. Hope you are all on the mend in the Koene household.